This is ESPN Sports Center. You’ll be spending the next five minutes with us. Now we’ll take you to college football. But today we’re watching a different kind of game. 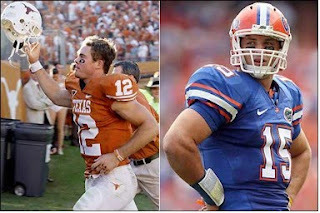 Colt McCoy, senior quarterback of #2-ranked Texas Longhorns, and Tim Tebow, senior quarterback of #5-ranked Florida Gators, lock horns and jaws for the nation’s Heisman Trophy award and collegiate football’s top honors. But outside of their huddles, they embrace as brothers in Christ. Tim Tebow, the home-schooled son of former missionaries, is lucky to be alive, much less performing on America’s hallowed grassy gridirons. After his mother suffered a life-threatening infection, doctors recommended that she abort little Tim, who would surely be stillborn. What the doctors didn’t know was God had plans for Tim that even a deadly amoeba couldn’t thwart. Tebow and McCoy proclaim their love of the Lord in huddle groups, on and off the field, at FCA camps, and to the media. From Facebook and websites, both young men witness of God’s working in the lives of those wearing jock straps and football helmets. Still, they were just two more sports celebrities to me. Then, for the sake of my son, who wears burnt orange and hangs a Longhorn flag from our porch, I turned on the tube to see both men caught in the throes of season-changing, nail-biting games. One lost. One won. But both were winners in the opinion of this sidelines coach. When a referee’s flag cost the Longhorns a possession, McCoy ducked his head and hurried off the field without so much as an arched eyebrow. As Tim Tebow’s Gators were wiped out by an explosive Crimson Tide team, Tebow continued to battle red-jerseyed opponents, then embraced teammate and opponent alike and shed silent tears on the sidelines. What I didn’t see from Tebow and McCoy—grimaces, groans, and excessive end-zone celebrations—spoke as loudly as what I did see—men respected by teammates, opponents, coaches, and fans. What else do I see in Tim Tebow and Colt McCoy? Classy young men wearing the armor of God during times when the lives of sports superstars have become littered with drugs, sexual escapades, even violence. Men who continue to place God as Lord of their lives above America’s great love, sports. I’ve joined my husband and son, sports fans, in tipping a hat to young Christian men who just happen to wield footballs with cannon arms. On December 12, Tim Tebow and Colt McCoy finished fifth and third as candidates for the 2009 Heisman Trophy, indisputably college football's greatest individual award. On January 7, McCoy’s Texas Longhorns will battle the Crimson Tide that defeated Tebow’s team for the BCS title game. Tebow and his Gators face Cincinnati on January 1 in the Sugar Bowl. Quite a bowlful of treats for a Gator and a Longhorn, huh? That’s it for ESPN. But it’s only the start of a bounty of eternal blessings in the lives of two young men who call on Christ as Savior. I'm glad to say that the little I know about this year's college football season, includes seeing the young man with John 3:16 on his cheeks! At least the cameramen and networks weren't afraid to show this and at it was one thing that a board member, legislator or lobbying group could not shut down! 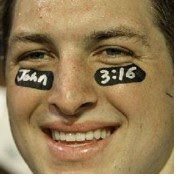 I love to see sports figures stand up for Christ and give Him the glory. Thanks for the details behind these two young men's lives, Patti. It was a blessing to see young men visible in their relationship with the Savior. The young man from Alabama who won, moved me with his speech giving God the first honor! Great post! Very creative too. Thanks, Patti. I'll be sure to read this to my sons when they come home from school today. I, too, have enjoyed watching these boys shine for Christ in the spotlight of success. Such an inspiration for my own sons who juggle their relationship with the Lord and family, sports, and school. Thanks, Patti, for highlighting their achievements and their character! Wow. It takes a pile of sterling writing higher than a goal post to impress me over anything related to sports. You managed it, Patti. Glory to the Lord for these two young men! Debra, yep, I loved the John 3:16 thing, too. Nope, I hoped to surprise Connie! Surprise, Connie!!!! Tamika, THANK you for spotlighting Mark Ingram, 2009 Heisman Trophy winner! My avid Longhorns fan actually CHOSE Mark of the famed Bama Crimson Tide as the most deserving player. What a blessing that AT LEAST THREE of the five finalists openly proclaim God! Adge, Dina, and D'Ann, glad your heart is pumping a bit faster than usual--like you sprinted to the end zone, perhaps??!!! Jeanette, every time I read your writing I am blown away. She's got it, yeah, baby, she's got it!! P.S. Next time you come to Normal, I'll take you to our indoor football arena!!!! Thanks, all of y'all, for stopping by!! Even though I'm not a sports fan, I'm happy to see young men committed to the Lord. These are the types of role models youngsters need. Thanks for highlighting good news in the sports arena. Great post, Patti. It reminds me of this year's Grey Cup which was played in Calgary, Alberta the last Sunday in Nov. Our own Saskatchewan Roughriders were in it against an upstart team from the east called the Montreal Allouettes. (Heh) We led the game from the start until the final play of the game. We should have won. We wanted to win. We deserved to win! And yet Montreal won with a miracle. We were devestated. How could we lose? Yet, how could we win when we saw the Montreal team bow their heads in prayer and the first words out of the winning quarterback's mouth was praise to His Lord and Savior. Indeed. I'm not saying the Sask team didn't pray or doesn't have believers because they do. We know they do. I'm just saying you never know where God has placed His children. I'm thankful for those sports figures who have the guts to stand up and declare their belief and be a role model for all those little sports people in the wings. Thank you Patti. A great start to my day. I'm a Sam Bradford fan myself. 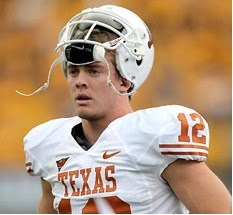 He's also a Christian and actually good friends with Colt McCoy even though they played for arch rivals OU and Texas. Patti, what a wonderful post. The stories of these young men blessed me. What a testimony to God's grace and goodness! I am on my knees for my own kids to grow up like these guys...prioritizing Jesus, doing their best in whatever God's called them to do, and sharing their faith with others. Thank you! Thanks for spotlighting these young men. We seldom see or hear about godly individuals walking out their faith with humility. Especially young men who have been offered the world. Chad, my husband and son megaphoned Sam Bradford, but the post was already bulging with football notables! Apparently Sam and Colt are good friends as well as brothers in Christ! Susan, thanks for the support! Anita Mae, didn't know you spoke Hockey-ese as well as fiction! CHAD, nice to have a guy drop in! You may been our, like 20th male visitor! Hope you felt welcome! Remember, all's fair in love and writing! Patti, we usually hear about the other end of the spectrum. The drugs, and all the bad stuff. Thank you for showing us the good parts too. Patti, what a beautiful post. Colt and Tim are two of my favorite college players. It's always been so nice to hear Tim end an interview with "God bless You." Robyn, we'll be trash talking "in a fun way" over the next couple of weeks!! Did you want the "Texas Fight" lyrics pasted all over your website? Connie, it was FUN!!! I really did pick football because of your interest!!! You've surely made your boy proud with this post, love! Bet he was a lurker, don't YOU??????????? Thanks to him, I got all the stats, the quotes--it was great. All I had to do was write it!!! I need to pay more attention to football! This was wonderful. Sending the link to my husband. That was great, Patti! I'm forwarding this post to my 15-year-old football freak! Thanks! Let me know what he says!!! Sandra, you are so sweet to visit! Hope to see you at my personal blog, though it's just plain old patti.